Faux Painting - Interiors by Laurel, Inc.
Erin and Chris Cocklin, live on the Alafia River in Riverview. 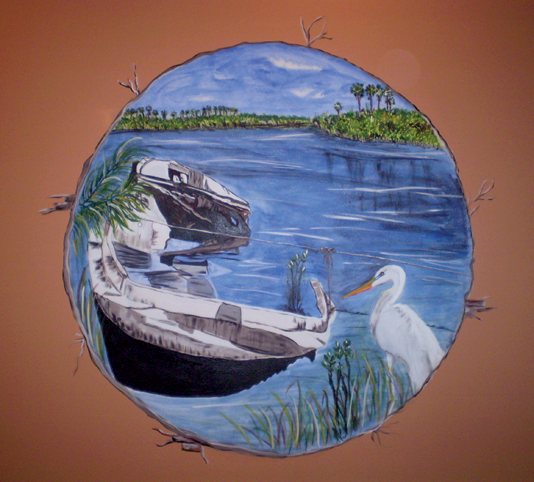 They love boating and Florida wildlife and wanted a sunken boat with a background of a natural marsh. I had a sunken boat photo which I took in Aripeka, Florida and combined it with a white heron for the look they wanted. The painting is done on their drywall in acrylic. It’s 5 feet around and has a painted, rough-looking edge to look like a broken wall with exposed bricks showing. They were very pleased!